CES supremo Gary Shapiro, President and CEO of the Consumer Technology Association (CTA), knows a thing or two about 'ninja innovators', and he also knows where they hang out. "Eureka Park in the Sands is where a lot of the wannabe ninjas hang out," said Shapiro to TechRadar. "We have 1,100+ startup companies right in that one area, and that's certainly where the future ninjas are." 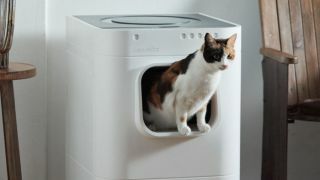 Cat parents, rejoice and welcome from South Korea the world's first and only cat litter box on the Internet of (nasty) Things. First, your cat jumps up into the main compartment to do business, and after it's left, LavvieBot noiselessly pushes a rake through the litter before hurling a few handfuls of clean litter on top. LavvieBot also deodorizes itself, and sends data on your cat's weight and, naturally, it's toilet schedule, to a PurrSong app. Yes, it's a bit of a statement piece, but since this is basically a robot toilet cleaner, who cares? LavvieBot launches on Indiegogo in May 2019. You've gone vegan, you hate single-use plastic, and you love talking. To plants. If that's you, this smart indoor garden on the Canadian Delegation's booth in Eureka Park is for you. A counter-top device with a self-contained water pump, humidity and water level sensors for automatic watering, and a HD camera for recording plant growth and 'harvest data', it's designed for growing herbs, lettuce and tomatoes indoors. It's also Google Assistant-enabled, so you can ask: "Hey Google, how's my garden?" The box includes pre-seeded, soil-free compostable pods. It's still in prototype stage, and being crowdfunded now, but should cost around $229/£180. Do you have trouble remembering faces? Wearable cameras have been around a while, with Google Clips the latest effort, but MyMe goes way further than life-logging to become something of a 'second brain'. Currently being crowdfunded on Kickstarter, MyMe weighs just 17g and contains a 13-megapixel camera, which it uses to create an AI capable of recognizing faces and text, allowing the wearer to tag and organise people in circles such as work, friends, and family. It will cost $399/£312 when it goes on sale in March. How much cleaner would your teeth be if you could professionally clean them in just 10 seconds? There's a lot of tech in Eureka Park from France, with one of the standouts being this '10-second toothbrush'. Consisting of a handle, a brush, a charging station, a storing pod and a toothpaste applicator, its makers claim that Y-Brush, developed and tested by dentists for three years, automatically deep cleans teeth using sonic vibrating technology and nylon bristles. Hailing from Lyon, France, Y-Brush is already on sale for $125/£99. This personal thermostat cools you down or heats you up on-demand. Getting hot and bothered in an airport queue? Just hit the Embr Wave bracelet and it will cool the temperature-sensitive skin on your wrist, creating a sensation something akin to the chill of an ice cube on your wrist, triggering your body’s comfort response to help you feel five degrees cooler or warmer. It can also recreate the comforting warmth of having your hands by the fire. Investors in its maker, Embr Labs, include Intel and Bose. Embr Wave costs $299/£235. CES isn't known for travel gear such as backpacks, but this one sports some top tech. Designed for cyclists, but just as good for those travelling by scooter, rollerblades and skates, the Le Galuchon backpack is connected to the eGalanck GPS navigation app. It lights up to increase the visibility of cyclists, sends vibrations into the arms of the rider for 'sensorial' guidance, and automatically signals using lights on the backpack's shoulder straps when you turn or brake. GPS trackers have been around a while, but only recently has the tech shrunk enough to become convincing for use with small dogs and cats. Winner of a CES Innovation Awards in Wearables this week, the 42 x 24 x 17mm, 15g pet tracker from a French start-up in Eureka Park's fitness technology zone gets around the other problem of short-range connectivity by shipping with a three year subscription to Sigfox, the low-power IoT network that works throughout most of Europe. It's waterproof, with a three month battery life, and permanently keeps track of a dog or cat's location via a phone app. It's on sale now for $112/£89, including that Sigfox connection. Anyone with tinnitus knows that they should have protected their ears years ago. Cue this earplug for music from Antwerp, Belgium, which is designed to reduce decibels while not looking anything like a hearing aid. Loop combines an acoustic channel and a filter, rather than a blocker, which allows sound waves to enter via a small opening and pass through a hollow acoustic channel. The result is clear speech and music, but with volume reduced by 20 decibels. They're on sale in five colors for $30/£24. The Amazon Echo Wall Clock may have been merely the first of many smart clocks. The latest salvo comes from Glance Tech in the Holland Tech Square, which is demonstrating a clock designed to get your eyes off your smartphone. Aimed at living rooms, dining rooms, kitchens, bedrooms and offices, Glance can be configured to set reminders – visible on its LED screen at a glance, naturally – of meetings, appointments and messages. Glance synchronizes with phones via Bluetooth, Google Calendar and iCal, displays weather, outside temperature and humidity, plays nicely with IFTTT, and comes equipped with a motion sensor and ambient light sensor. It's on sale now for $199/£157. Over in the Taiwan Tech corner is Jarvish, which has an on-sale-soon concept of a motorcycle helmet embedded with augmented reality tech. At its core this helmet is designed to give the rider 360° vision, with a tiny heads-up display showing the feed from a camera on the rear of the helmet. In that way, it's much like Google Glass. However, it's also got embedded speakers that deliver 360° audio, it records footage from all journeys to an SD card just like a dash cam, and it can even broadcast everything in its field of view live to social media if you ask Alexa, Siri or Google Assistant. It also includes voice-activated navigation. It will go on sale in September for $1,599/£1,263.